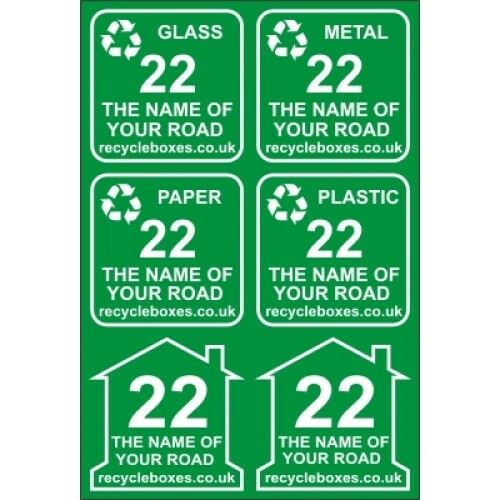 Please note: these have increased in size (from March 2009) - each is now 170mm square (6 labels in total). Put your very own address on your boxes. 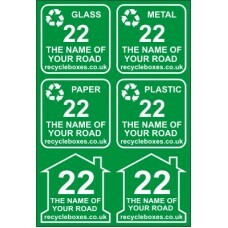 These vinyl labels look great, last for years outdoors and are colour fast, regardless of sunlight. They are made from the same material as the logos you see emblazoned on just about any delivery van and truck. They stick nicely flat on the SIDES of our kerbside boxes (whereas on the ENDS they follow some undulations) and to wheely bins. 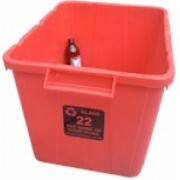 Plus one each for your garden waste bin and your regular rubbish bin. The label is white, like it is shown here. 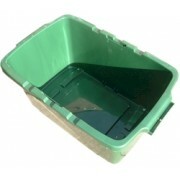 The green area is peeled away and discarded, so the surface of the box is exposed there. These will bear your My Account primary address (not your Delivery Address which might be different). You can check this primary address by clicking My Account above, then reviewing your address book. Alternatively please ensure to add a comment when placing your order, specifying the address to use. The customised text is limited to a house number or name, and a street name.